Fantastic service. My Husband loved the watch and I loved the price. Absolutely beautiful watch. Brought it for a 21st birthday present and son was over the moon. Excellent quality and superb fit and very comfortable to wear. I liked the look of this watch on the web, and I can confirm that it looks even better in the flesh. It’s clear to read and the strap with its red stitching looks good. There is a nice touch of a very small red arrows aircraft on the end of the second hand. I also like I don’t have to worry about batteries anymore. Avery nice addition to my collection. The watch is brilliant! The chronograph feature works great and I love the design! Even the box is great and very high quality. I really like the fact that you never have to change the battery as it is using Citizens Eco-Drive system. This is a beautiful timepiece and well engineered. The watch is lightweight and the dials are relatively easy to read. My only criticism is that the leather strap could do with being 2cm longer, I do not have a wide wrist but I have to have the strap fastened on the last 2 holes with does not leave a lot of strap to tuck under the buckle straps. Also the watch features a 24 Hour GMT World Time Feature, unfortunatey the included operating instructions do not explain how to use this feature, but more surprisingly to me the instructions do not even show the crown button on the watch that operates this feature. The included instructions are generic. I emailed Citizen UK who replied within a few hours and priced a link to the Enhanced Features and Functions Guide which covered this enhanced feature and other features on some Citizen watches. Excellent service, and price. Ordered at 10.20am on Friday, delivered 11am on Saturday. Free delivery, paid for gift wrapping which was nice touch, and made gift extra special. Would definitely recommend Watchshop, could not of asked for more. Lovely watch with Citizen legendary accuracy. Delivery service faultless and next day. Great looking timepiece and good historical link to the 50th anniversary of the Red Arrows. Very pleased withe purchase and also the presentation box. I ordered the watch to be delivered to a Goldsmiths store - arrived the next day! The packaging was great as it came in a lovely Red Arrows designed box. The recipient loved the watch - looked very stylish and fitted perfectly. 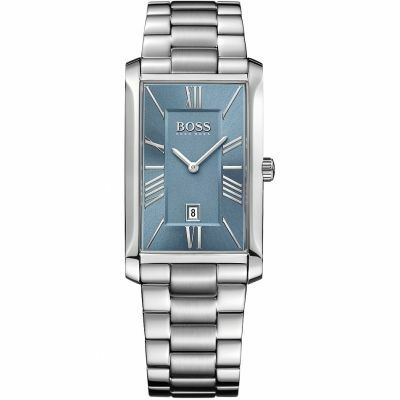 Lovely watch bought it for my boyfriends 21st Birthday, he doesnt have it yet but I know he will love it, fantastic watch, thank you! I bought this watch for my husband as a gift and he loves it. Tremendous savings on high street prices with an additional discount that put the cost nearly £60 below other stores. Looks good, not too heavy and I can see the time without my glasses. Something I cant do with a lot of watches. As noted on another review it seems odd that the date shown is that of the world time zone setting not the home zone but in practice the home and world times can be set the same so no real problem. One warning though. I have the tools to adjust bracelet length but this one nearly defeated me. The pins slide out easy enough but they are held in place by tiny tubular springs which are a loose fit in the bracelet once the pins are removed and are VERY easily lost. Once found they are so small they are hard to pick up, even with tweezers. I lost two trying to pick them up and eventually discovered that threading a needle into them was the best way of refitting them into the bracelet. Fortunately if the bracelet is being shortened some spares are available as I still have two lurking in the carpet somewhere. Xmas present for my husband. I was very very impressed on delivery. My husband thought it was really classy and it looked really good when wearing it. We loved the red stiting and the logo on the back of the watch and we especially loved the plane on the second hand. Exactly what I was expecting!!! Lovely watch. Good quality. My husband loves it. Amazing watch, just as expected. My Dad loved it as a Christmas present. Thank you Watch Shop, for your amazing contribution! Just the right size some are far too big for the wrist. I will not buy a watch other than Citizen. Relayability is outstanding and this new purchase will be added to my already collection of five giving me a variety of different watches for different occasions. Very good looking and very well made watch. Having spent a lot of time looking for a chronograph watch I made the right choice. This is an excellent watch and in my opinion the best one in the Red Arrows series, the black leather strap with the red stitching sets off the watch face really well. Very easy to use and the second hand even has a hawk jet on it, the back of the watch has the squadron logo on it too. The whole look of the watch is stylish and the packaging is well made and looks great too. Lovely watch, a Christmas present for my husband which is chose himself. It is a perfect gift. This watch is a very good quality. I recommend it to everyone who want a perfect watch!!! Watch looks amazing and the service level was fantastic. Only complaint if any was that parcel containing watch was left by side door without it being signed for. Luck it was still there! The watch was everything I expected. A high quality watch, that looks and feels more expensive than it was. Very quick delivery. Bought as present and looks smart. Great service, ordered on Saturday, delivered on Monday. 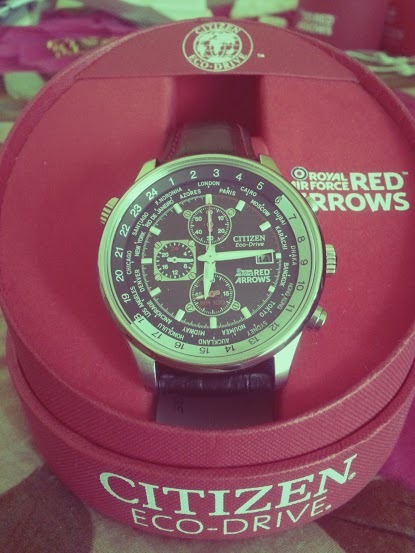 Ive been a fan of the Red Arrows for years and also Citizen Eco-Drive as Ive owned another Citizen watch for a few years. These things put together is a perfect match. Love the watch, fits really well and looks very impressive. One of the best value for money watches. A luxury watch! I suggest it 1000%!!!!! Thanks watchshop, an excellent service. Great watch. Nice dial. Strap could be longer. 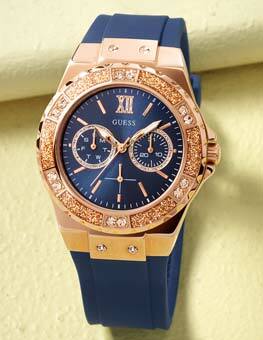 Its an amazing timepiece, looks awesome on the wrist and the colour combinations really make it stand out. i bought this watch for my husband, he saw it on your web site and really liked it, he was not disappointed when it arrived, which was very quickly, next day wonderful! He has had the watch now for over a week and it is an excellent purchase. It keeps excellent time and is a very smart looking watch. The colour sets it off too, it is not too big, just a very nice looking watch. Good looking watch. Easy to use. Quite small dials. Great service arrived quickly. Originally brought as a gift but such a great deal kept it and brought another gift. The watch arrived on time. However the item photos show Red Arrows box and CD which were not included in the package. Slightly disappointed about that. The watch came so fast i was very very impressed and it looks great! Great watch. Nice and light but well built and sturdy. Excellent watch for the price. Not only does this watch not need a lot of maintenance, it is classy and stylish as well. 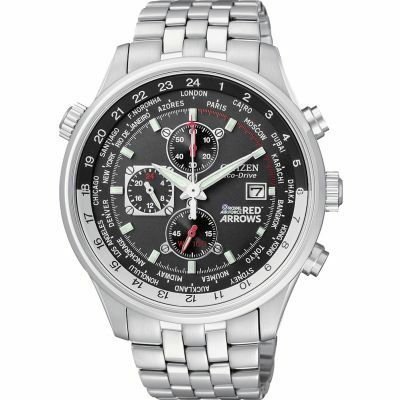 The best part for me is the tiny fighter jet on the chronograph hand. Its not easy to spot in the photos, but looks great when the chronograph is running. The only downside is the quality of the leather strap. Its a bit flimsy in that it is quite thin and liable to tear on rough use. As with everything, a bit of care of the strap is needed. On most Citizen watches, while the watch itself is of great quality, the leather strap always seems to be lacking. A lovely elegant watch thats a little bit different from others. 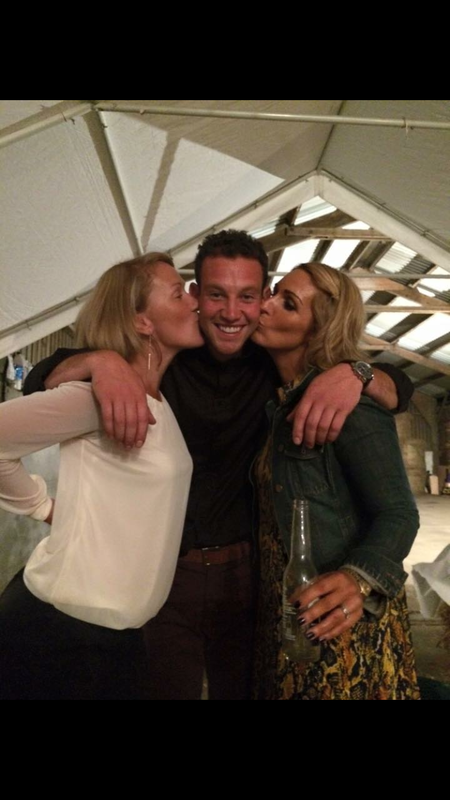 Proud to have one of britains main icons on my wrist red arrows. Had one before which unfortunately got stolen so ordered its replacement within a week. Very smart and stylish at work or going out. Comfortable to wear all day. Excellent watch great design and with no batteries required I am really enjoying wearing this time piece. I was very impressed with the delivery the order everything was done as quickly as possible. Am very happy with my watch. Having owned a Calibre 8700 for the last ten years, I was so impressd that I decided to treat myself to yet another Citizen watch. This Red Arrows watch is a fantastic piece of kit with a very stylish balck leather strap with red stitching detail. I cant really say that there is anything I dont like about this watch, although the case is a bit bigger than the Calibre 8700. However, it is not so big that it catches on anything. Having owned many watch brands over the years, I dont think that you can beat Citizen for quality, style, and value for money. I can also vouch for the service from Citizen UK as they were excellent when I did have a problem with my Calibre 8700 a short while after purchase. Nothing was too much trouble and they had the watch repaired and returned to me within 10 days. Other than that, excellent.....dont buy any other brand!! The product itself is top notch high quality,what I like the most about my watch is the fact that it looks like it should be double the price I paid for it as theres so much going on and the detail is 2nd to none..for me the strap is sound as I have small wrists that is the only fault I could pick but it works in my favour.the watch itself has a black leather strap with red stitching there is a stopwatch on the face that u use by pressing the top right hand button in total there is 4 buttons so much going on looks a lot more expensive than actually is, can wear it as smart or smart/casual. So pleased with my buy and Ive already recommended to friends.thankyou. 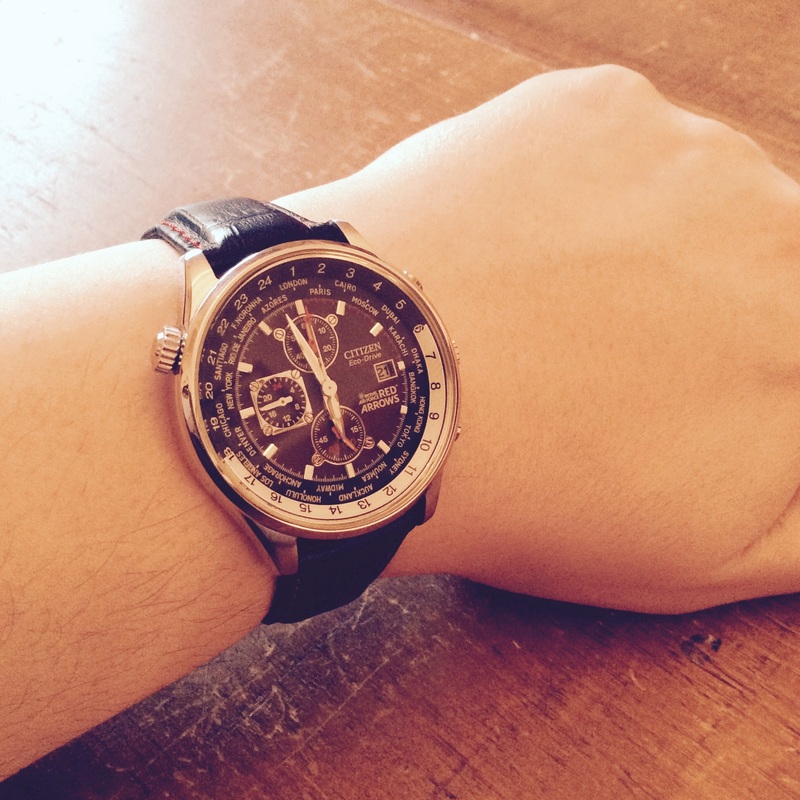 This is the second Citizen purchased from Watchshop. As always, service is excellent, next day delivery etc. perfect transaction, many thanks. 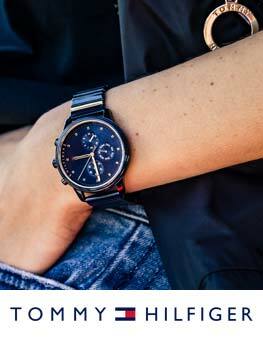 As for the watch, it looks great for both casual and formal wear. The red stitching on the leather strap compliments the red highlights on the hands and dial. The polished steel reflects the quality and the accuracy to date after 1 week is spot on. It has not gained or lost a second. Bonus feature - the chronograph second hands sweeps like a mechanical movement - 6 beats per second. Now that is cool for a quartz watch. I recommend this particular Citizen very highly - anyone thinking of buying one will not be disappointed. Thanks again Watchshop for your excellent service. I was looking for a watch with a very specific look and this fitted the bill perfectly. The watch comes in very nice Red Arrows branded packaging and looked great. 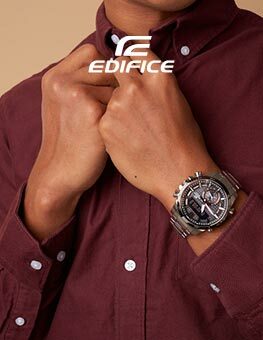 The face is large and clear and the watch is not to deep meaning it can fit under the cuff of a shirt. The leather strap looks great in black with red stitching but I am not sure it will last too long. The watch does not feel very heavy but it definitely has a quality feel too it. Citizen are a reputable brand and this watch is extremely good value for money. 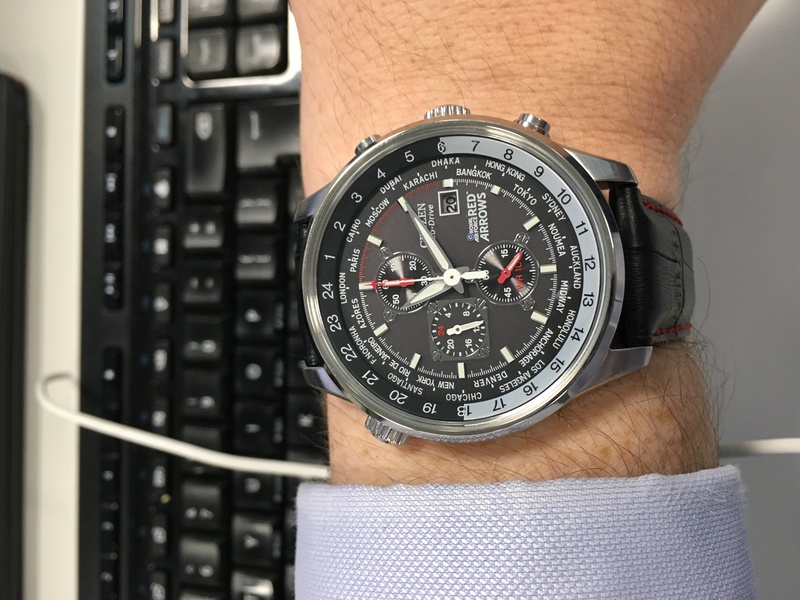 I am very happy with it and would highly recommend it, so much so that I am looking to purchase more Citizen watches as I am so happy with this one. The product is just fantastic!!! !, and is just how I believed it would be, with exceptional detail. The whole watch is well-crafted and designed, and there is not anything I could say I dislike about it!!! The black dial, silver hands and genuine black leather strap with red trim,just finish off this great product perfectly. The bonus too is you never need a battery, which is an outstanding feature!!!! Definitely value for money and if you are looking for a watch which combines style with a real expensive look, then look no further than this great product which I would recommend to anyone!!! The product itself was exactly as pictured and arrived next day well packaged. Very modern features multaple features and a nice black leather strap with red stiching finished it off very nicely. It is very easy to set up and information in the instruction book is easy to follow. Its been long since Ive been looking for a time piece. 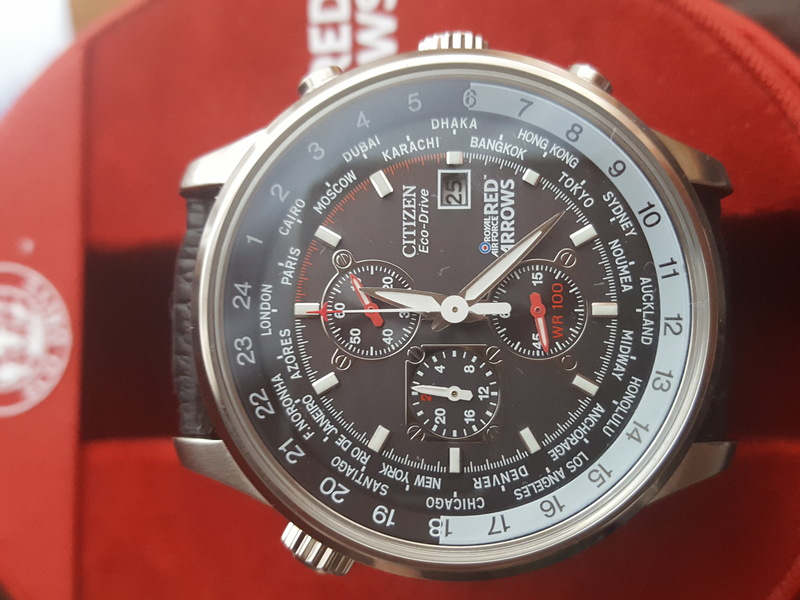 The citizen eco drive red arrows watch is truely what suits my requirements of a light, sporty, sophisticated yet simple watch. I highly recommend this watch to everyone who has a serious liking towards a zero maintenance and highly accurate watch. With the citizen eco drive technology one doesnt even have to worry about replacing the battery. A complete satisfaction for me. It wouldnt be fair if I dont mention the impeccable service demonstrated while delivering this watch. Highly impressed by the service. A very satisfying experience. I like this item, because its a very clever watch. You dont have to change the battery and you can see what the time is in other countries. Its elegant and not heavy. This product showes that the person who is wearing it has a very good sense of taste. This watch has black colour with some red affix. I bought it for my partner and he was so pleased. Bought this watch as a present for my husband and he loves it. The watch is very stylish and elegant and just love the second hand which has a red arrow plane at the end of it. Looks really expensive and very stylish. Would definitely recommend it. 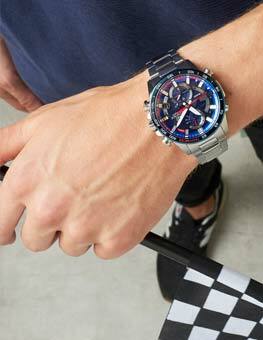 I had seen this watch on the website and attracted to the design straight away. So I decided to order it. When I received it I was not disappointed. The watch looks and feels like a watch that should have a much more expensive price tag. I recommend this to anyone who wants an everyday good looking watch you wont be afraid to wear on a day to day basis. Awesome replacement for my accurist, fits well nice easy to read face. Easy to set up. From the very beginning, I was amazed by the quality of this watch. It looks and feels more expensive than it actually is. Lets start with the features themselves. It is an eco-drive so you never need to change the batter or wind it eco-drives in general are very good value for money compared to awfully expensive mechanical watches. If you leave it decently exposed to sunlight not necessarily on the window sill, you will never run out of battery compared to mechanicals which dont last for more than a couple of days without being used. It has a date function, chronograph, visible hour/minute hands and hour markings which also glow in the dark making it very easy to read the time at night. The red stitching on the good quality but not extraordinary leather strap match the second hand and other fine details on the watch. I am not judging the strap as excellent just because I have seen better for watches of the same price, but it is very comfortable and the right size. It is suitable both for formal and informal occasions which I find very convenient. For people who travel a lot and want to know time differences without browsing for them, the world time in 24 cities feature is very good. Just a few tips for potential buyers: use the price match request option to get it at an even better price. Watchshop service: 5/5, excellent as always, arrived in very classy case, very well-protected. Excellent very good size watch, has a heavy, qualitative feel to it. Eco function works brilliantly, chronograph as well. Very good delivery from Watchshop, as always. Cracking looking watch and strap. Does exactly what it says on the tin Also looks smart while wearing. Love the overall design of the watch. It can be worn to any outings or parties. Looks like an expensive watch and feels good in your wrist. Ii got this watch for my boyfriend and he absolutely loved it. he travels a lot and had been to most of the cities on the watch so it made an ideal gift. It fit perfectly, was a little worried it might be too big. Thankfully it was not. As good as it looks on the website, presentation is good, and the watch is great. 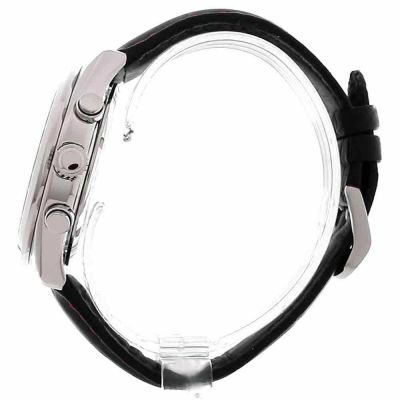 wonderful product and gift-my husband loved it as watch is completely worth the money it looks very nice and it can be worn with different styles and occasions. Built quality to the great standard and would recommend it to anyone for purchase. Added prestige to the look of the watch. Drawbacks are relatively short strap and instruction supplies on print and cd are not for this watch. Other than this we both are very happy with purchase. I was impressed with sales follow up and delivery no hassle at all. Love this watch, looks very smart but also great for casual wear. Its great to think youll never have to change the battery. As I often work with international clients, I actually find the world time function very useful, although it took a while to figure out how the inner bezel works. Overall, very satisfied! I purchased this watch as a gift to myself to commemorate my time in the RAF ending this year. I love the styling, the chronograph dials are designed with small screw detailing to look just like cockpit instruments. The attention to detail continues with the second hand which is tipped with a small red arrow. The back face of the watch features a full colour RAF Red Arrows crest which ties all of the details together nicely. This piece also features a world time dial, this rotates smoothly within the watch face as appossed to on a bezel around the outside. Overall the styling of this watch is as detailed as a cockpit instrument and as beautifully crafted as one too. My only negative to this watch is the strap. I find the leather strap a little too small for my wrist, it still fits with a few holes to spare and is comfortable too, however I would have liked a little more room. All in all this watch is a beautifully crafted highly detailed timepiece in honour of the best aerobatics team in the world, the Red Arrows. Combined with Citizens Eco-drive technology which means you will never have to buy batteries again, this is a fantastic watch at a great price! Fantastic looking watch, I have a small wrist and thought it might look a bit big, but its based on a pilots watch which is correct. Great presentation box. I live in Licolnshire and often see the Reds flying , so it seems apprpriate to own this watch. I purchased this for my soon to be hubby, he was over the moon with it. Comes in a lovely red presentation box and the watch is of a very high build quality. Great watch. Comfortable and stylish while not overly extravagant. Glow in the dark dial is really easy to read. Even though I have a small wrist it still doesnt look overly large or too big for my wrist. The watch is worth its price and is a really elegant piece. An ideal watch for both formal and informal functions. Functions include 12/24 hr, date function and a chronograph. The red stitching on the black leather strap makes the watch stand out and matches the second hand which is in the shape of a red arrow. The Eco- drive functioning would mean that i would never have to worry about changing batteries for this watch. I was skeptical about having to buy the watch online and would have rather bought it in-store but I have no regrets having bought this online. 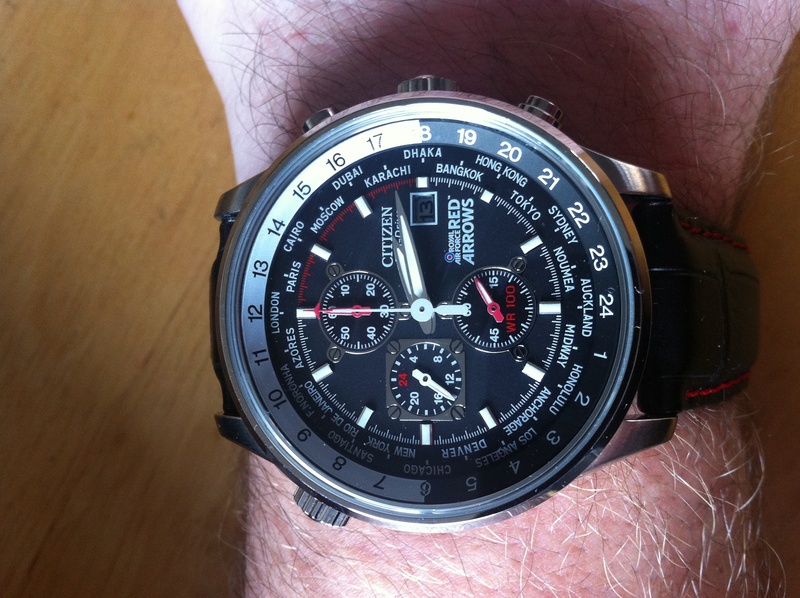 I am now a proud owner of a Citizen Eco - Drive. Quick point on service - I found the watch listed cheaper on a different website. I used the price comparability function and immediately received a price match which was even better than that listed on the other website. Service was impeccable and the watch arrived within 20 hrs of my ordering online. It gives me a feeling that it is a professional's watch. Its design is awesome and this watch is just amazing. With the ECO driver, i won't need to worry about changing batteries and actually there is a one more thing i really feel the designer have put in a lot of effort on to this watch watch which is the fluorescent hands design. It allows me to read the time clearly in dark condition which i feel really like it. I have a collection of Citizen watches and as usual this watch ticks all the boxes, its not just stylish, it delivers what a mans watch should deliver, rugged looks simple but useful functions, water proof for the outdoor man, Citizen also have an excellent service and repair center for all those little mishaps that can occur, finally this website was very user friendly, easy to navigate through and and excellent delivery timescale and tracking system available I would not only recommend the purchasing of this watch, I would also recommend this website to purchase watches and jewelry from. Very pleased and have recommended to friends,and will carry on doing so! I loved this watch! size is perfect, style is awesome not over neither under glamorous..the color combination of black and red is really perfect to wear..you can wear it casually and for special events..worth the price! defo recommended!